Skip the first question to avoid a To All The Boys spoiler. 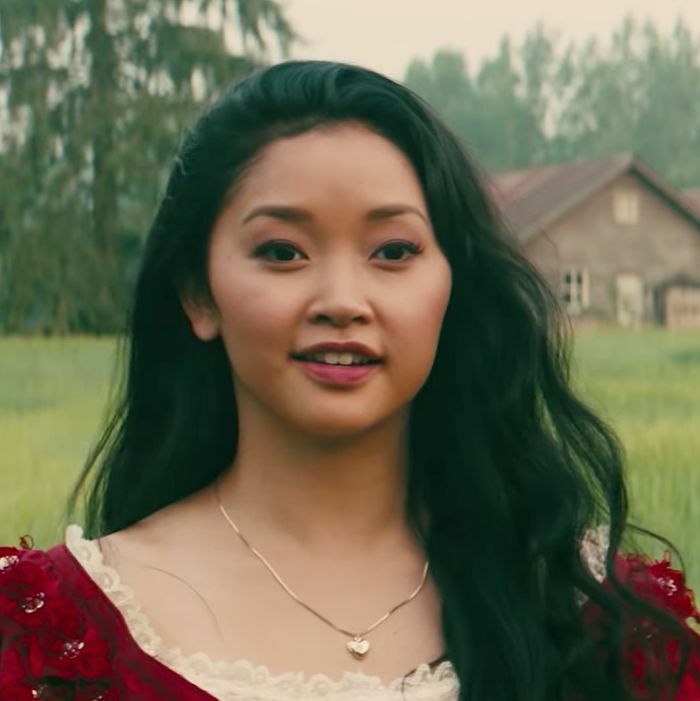 Lana Condor knew she had to book the role of Lara Jean Covey, the daydreaming, badly driving sixteen-year-old at the heart of To All the Boys I’ve Loved Before, based on the best-selling YA novel. Lara Jean, lovesick and lonely, writes love letters: to all the boys she’s loved, when she can’t bear a particularly fervent crush, when she has to find some way to articulate her emotions so she can dial them back. She’s written five in all, never intending to deliver them. But just as she’s recovering from her oldest sister’s departure for college, they’re mysteriously mailed — and her older sister’s boyfriend Josh Sanderson (Israel Broussard), cool guy Lucas James (Trezzo Mahoro), and hot jock Peter Kavinsky (Noah Centineo) all learn about the crushes she’s been harboring. Condor was so nervous at the audition that she accidentally (but politely) rejected her future co-star: During a pre-read, she barely even said hi to Centineo. “I was like, No, you will not be distracted, Lana. Do not … you have to focus on this role! I was so laser focused,” she says. To All the Boys I’ve Loved Before is full of that same infectious delight. The movie makes real stakes out of telling someone you like them and of opening up to a crush, and makes entering a new relationship feel fresh and flirtatious. It’s like Bridget Jones’s Diary, 10 Things I Hate About You, and She’s All That rolled into one. As Lara Jean, Condor remixes the bookish teen heroine into something new: a girl who feels things deeply, but has a hard time articulating those emotions when she’s not alone. Condor told Vulture about her audition, her own experience with love letters — and how Lara Jean taught her to be more open about her own emotions. This is my favorite movie of the summer, and I’m dying to know: When you first read this material — the script and the book — were you rooting for Peter or for Josh? That question keeps me up at night. It really does. And I remember thinking to myself, oh boy, when we start doing press for this movie, this question is gonna haunt me for life. Josh is such a good guy. But I think inevitably, Lara Jean choosing Peter was the way to go, because I think in a romantic partner, you want someone that pushes you out of your comfort zone to break down your walls and challenge you a little. And I think Peter challenges Lara Jean in a way Josh does not. But when I first read the script, I was so giddy reading it, because I wanted it so, so badly. I wanted to be cast so badly. So I was like, oh my God, this is amazing. This is everything I’ve ever wanted to do. Reading the script and the book was just so exciting. It’s a great book, and it’s enjoyable and it’s fun, and relatable. It was a dream come true. Can you tell me a little bit about your audition? Where was your head that day — nerves? I got the audition and then I ran to the bookstore and bought the book, and read the book really really fast. And then the day after, I auditioned, I did pre-read. And I actually saw Noah in my pre-read. After that I did callbacks, and producer sessions, and director sessions, and chemistry reads, and finally booked it. And I screamed bloody murder when I got the call from my agent that I got it. It was seriously a dream come true. The audition process was definitely rigorous. They were seeing a lot of girls. Noah told me that you both met in the audition room. He said he asked to run lines with you, but you very politely turned him down. Is that how you remember it? That’s literally what happened, yeah. For the pre-read, when I first met Noah and he asked me to read lines with him, I was sitting in the waiting room. And I saw this beautiful tall man walk through the door. I immediately clocked that he clocked me, and he walked over to me. And I was like, No, don’t come over here. Don’t come over here. Don’t come over here. I have to focus! So when he asked me to read lines with him — and, you know, Noah is so swaggy, he’s so chill and so cool — he was like, “You wanna read lines with me?” and I just said, “Yeah, sorry, no.” I was just wanted to focus, and I didn’t want to get distracted by this cute guy. But then, when I did my chemistry read, and I found out he was gonna be in the room with me reading with me, I was horrified, because I was like, Oh my God, this is the guy that I turned down, and now [it’s] the chemistry read, and he’s gonna hate me. And the first read with him, I knew immediately he was gonna be cast. Immediately. He was so good. Have you ever written love letters, or ever received them? Oh my God, yes. To this day, I write love letters. I have a hard time expressing myself when I’m emotional, so my family has done this forever. We write each other letters if we’re fighting or whatever. And my dad’s a writer, but we write each other letters because we feel that it’s easier to get out what you’re truly saying if you write it down. Because sometimes, when you’re emotional, at least for me, I can’t really articulate myself when I’m emotional. No one writes each other letters anymore, but I think there’s something so special about receiving a really heartfelt letter, still. Something that really resonated with me in Lara Jean is that she has such a hard time confronting and explaining her emotions. Have you felt that? Yeah. I’m very fortunate that my partner is very able to articulate his emotions, so I’m learning how to be better at it watching examples of it. But I’ve been told, Lana, you have to learn how to be able to vocalize, and show what you’re really feeling. I tend to just shut that down, ‘cause I have a hard time telling people how I feel, but I’m learning. I’m learning. And I think Lara Jean’s kind of awesome. Lara Jean and her best friend Chris have such a funny, natural best-friendship, so I wanted to hear about your best friend. My best friend is my boyfriend. It’s a dream come true. We laugh all the time. I think that’s very important, that a friend makes you laugh, and you’re just giddy around them all the time. My best girlfriends are just very supportive, similarly to Chris and Lara Jean’s relationship, where they’re supportive, they have my back, I have their back. I’ve been very fortunate to have good people in my life, and when you find good people, you gotta hold onto them real tight. So you’re in a relationship right now, but do you have a memory of a particularly devastating or embarrassing crush? I remember the first time that I was broken up with. And that was devastating, ‘cause you feel like you will never be the same. You feel like your heart is breaking. You feel it. You feel it. It was eighth grade, and that was the first time anyone ever broke up with me, and he just told me that he had to break up with me because I liked him more than he liked me. And that was devastating to hear that. I know, that sucked. But I don’t know … embarrassing? I embarrass myself all the time, but that was definitely the most devastating relationship thing that had happened to me in my short life. I watch a lot of coming-of-age movies, and I think a lot of actors play teen girls too young. But Lara Jean feels so fully realized. Can you tell me how you developed her? I was 20 when I played Lara Jean, I think. I got a lot of help because the cast is so great, and we’re all within similar age ranges. Being with Noah makes me feel like a little girl. So he actually really helped me be able to play younger. Because I’m giddy around Noah. I love him, I’m giddy around him, he makes me giggle and makes me really happy, so actually the cast really helped. Noah, specifically, really helped me feel like I was a high schooler again, a teen again. There’s this other element in the story, too, about loss: Lara Jean’s mom has died, and Peter’s dad left and started a new family. That feels like an added dimension for a teen romantic comedy that made it feel so real. I think it’s a layer to who they are as people. I think the way that they process loss is actually pretty healthy. Lara Jean, she fears letting other people into her life because she’s afraid to lose them again like she lost her mom. That’s so real and heartbreaking and I think there are so many people out there that can probably unfortunately relate to that. Hopefully, that part of the story will touch people and show them to still keep your heart open even when you lose someone, because they’re always with you in your heart, you know? Were there any scenes that you really liked that didn’t make it into the final cut of the movie? Oh, God, my memory is so terrible. I think there are a couple scenes that I did with Josh that didn’t make it in, which I wish had. I’m not sure — or maybe I just wanted Josh in it more. I’d also like to talk about identity and representation: I was so excited to see a movie really explore the inner life of an Asian teenage girl. I think what’s so amazing about the movie is that, number one, I’m beyond thrilled because opportunities like this don’t come around that often for me where the lead of a rom-com happens to be Asian. With this movie, yes, the lead is an Asian girl, but I feel like when you watch the movie, you’re just watching the average American family in the real world and it’s not in your face. This is not an Asian movie, it’s just a rom-com where it shows real families and real life. That’s what’s so exciting for me, because I think that should be our goal in the industry. To just show stories of real people and then after the fact you’re like, “Oh, my gosh, that was an Asian girl. How exciting!” It comes so naturally in the movie and we barely ever reference it, and I think that’s awesome.